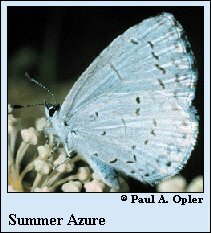 Identification: Upperside of male powdery blue often with ill-defined white patch on hindwing. Female with much white scaling on both forewings and hindwings. Underside of hindwing pale gray or white with small black dots and submarginal dark zigzag line. Life history: Caterpillars eat flowers. Chrysalids overwinter until flower late spring or summer. Flight: One flight from June to October. Caterpillar hosts: Racemose dogwood, New Jersey Tea, and other plants. Habitat: Various habitats including stream valleys, powerline right-of-ways, gardens. Range: Most of eastern and central United States as well as southern Canada. Canada. University of Toronto Press, Toronto. 282 pages, 32 color plates.